Peter Wilby tells it like it is. We are all financial journalists now, it seems, and the Treasury Select Committee has been grilling financial jounros about their role in the slide into recession. First journalists were accused of not predicting the recession (in fact, several had done so several years ago, and were roundly ignored). Then they were accused of frightening the punters into taking their money out of Northern Rock. Current Media Guardian columnist and former Independent on Sunday and New Statesman editor Peter Wilby spoke at a recent meeting on the role of financial journalists in time of crisis. Read my report on this here. 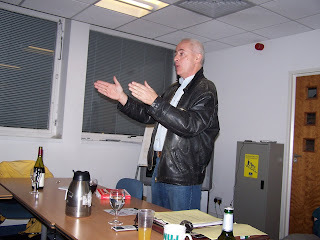 Nick Davies, investigative journalist (recently at work on the Guardian's investigations into corporate tax avoidance) and author of Flat Earth News, warned journalists at a recent meeting that their profession is 'disintegrating. 'Rather than dwell on this, however, Nick urged journalists to look for new models for how to much money out of journalism. Read my article in the March/April 2009 Freelance for more. Lens limits - government says "Cap it"
The February 2009 (online) only edition of the Freelance is now out. It includes a report on Home Office Minister Vernon Coaker's less than helpful comments on government policy on restricting photographers, and examples of clueless Police Community Support Officers telling photographers (professional and amateur) that they can't photograph in a public place, with or without a (mythical) 'licence'. Read more here. The March Freelance will be out soon. I went to the slightly terrifying BETT Education Show at the end of January. BETT used to stand for something once, but its PR people now tell me it’s just BETT, which doesn’t stand for anything in particular. As a humble correspondent for an English Language Teaching industry publication, I naively expected that the show would actually have something to do with education. I couldn’t have been more wrong. As part of the state’s current War on Young People, most of the kit on show was schools management systems software, attendance management kit, swipe cards to monitor where your students are at, CCTV cameras, kit to spy on what the kids are chatting about online, knife arches, electronic locks on equipment, and all the expensive paraphernalia of the iron boot of top-down coercive control freakery. No wonder there’s not enough money for teachers and books, all the money being thrown away on stuff to not very effectively spy on, regulate, and control the kids. One day, in spite of the apparent best efforts of the managerial castes, the younger people of this country will attain positions of power, while us less young people will be forgetful old folks in need of them to provide an elderly care infrastructure. Will the younger people of today be in a forgiving mood towards the generation that fired subsonic Mosquito electronic warfare devices at them to disperse them, or issued Dispersal Orders on them to stop them congregating, or put them into a coercive ‘school attendance management system’? I don’t think so. 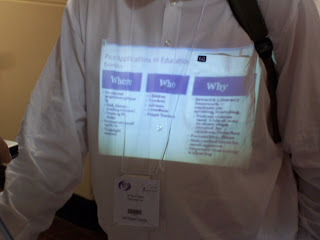 Then there are interactive whiteboards. As the EL Gazette’s Mexico correspondent, teacher Paul Morris told me, “Don’t get me started on interactive whiteboards!” He points out that the youth of today are disorientated enough by lots of streamed images and things going ‘beep!’ around them all day, miniature films coming in on their mobiles and computers, keeping them in a state of permanent distraction. The last thing “the kids” need is more time spent passively staring at screens. It was noticeable that among all the tech, tech, tech at the trade fair, the biggest crowd puller was a little space with some seating and a guy from government and a guy from education, sitting down talking about exam-based learning versus knowledge for its own sake. The only tech they had was a couple of radio mikes they were talking into. And the space was packed with teachers listening intently. With all the distracting images dancing around the kids these days, the calmness of actually sitting down and having the sound of real person just talking is more important than ever. The interactive whiteboard industry, however, carries on regardless. The UK industry, with giants like manufacturer Promethean (excuse the pun) got a boost in the form of a £5 billion government investment in “education technology” (kit) when Blair took power in 1997. But they, and whiteboard market leaders Smart (Canadian) and Hitachi, look like they’re about to get hammered by the various Chinese exhibitors who were showing off giant flatscreen high-resolution anti-glare plasma screen TVs whose screens you can write on with a light pen. There’s less radiation, less power used and no fiddly expensive bulbs. Promethean’s vast trade stand had a dedicated demonstrator who spend three whole working days just showing off interactive whiteboards, in Spanish. There were a few items of kit that impressed me – simple, democratic ideas that filled an actual need. Pocket Projectors do exactly what it says on the tin, they are projectors the size of a mobile phone, ideal for an audience of about six. Their demonstrator said he did presentations on the Tube with them, and projected onto the white shirt fronts of his corporate clients. The white shirt fronts of Pocket Projectors' corporate clients have proved handy for projecting presentations onto whilst giving presentations on crowded Tube carriages. ABCi Ltd run surveys for school students, asking them questions about their school, with people reading out the questions if they can’t read the questions yet. The finished surveys link to action plans, which you can get in person on the phone as well as online. A recent primary school survey they ran had a lot of questions about the school toilets, because that’s where the bullying happens. One BETT punter, a university professor was unimpressed, “Why should I care what the students think?” he asked ABCi people. He was presumably more interested in the knife-arches and the attendance management package. Subsequently, one of the people from BETT's PR agency admitted to me in an email that she visited a refitted secondary school and was a bit taken aback by the extent of the 'big brother' technology in use to ensure every student was in their lesson on time.